Many people dream of owning their own restaurant one day. You get to work with people every day, prepare delicious food, and own your own business, allowing you to be your own boss! To many this sounds perfect! While there are many benefits to owning a restaurant, especially if food and hospitality are your calling, there are also many down sides to the business. Here are 5 common myths about running a restaurant. It’s glamorous. Actually, it can be quite the opposite when you are starting a restaurant. As the owner, you often have to pick up the slack when others are unable to work or fail to meet your expectations. This will involve messy work like cooking, cleaning, rearranging furniture, cleaning toilets and other maintenance. 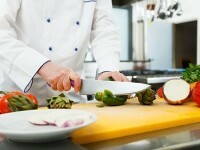 Be prepared to get your hands dirty and put your blood, sweat and tears into this restaurant in order to be successful. It’s an easy way to make money. While owning a restaurant can be lucrative, it is also risky and your business may fluctuate regularly. There are sometimes slow seasons or times when business just isn’t as consistent or reliable. Unfortunately, if you don’t make the money you had predicted or hoped for, you get paid last. Sometimes in order to pay your employees, this may mean you go a month without a paycheck for yourself and are only able to cover your bases and make ends meet. You can enjoy being your own boss. While working for yourself has many advantages, it also has down sides. As your own boss you don’t have to take orders from anyone else, but you do have to make all the big decisions. Therefore, a lot of responsibility falls on your shoulders and you need to be up to it. This involved financial obligations and responsibilities as well as dealing with employee disputes or problems in the workplace. This can become quite stressful and requires serious organization and multi-tasking skills. You don’t have to work a 9-5. Depending on your restaurant’s hours, this may be true. However, you will likely end up working much, much more than an 8 hour day. Often owning a restaurant involves tons of overtime hours as well as unusual late nights or early morning. You will also have to say good-bye to weekends for a while. Restaurants make most of their money during the weekends, so this is the time you will need to especially invest in being at your location and working to provide a high quality dining experience for your customers. Security. In reality it is quite insecure. Aside from money and income, you also have to think about benefits, insurance and healthcare. When you work for someone else, often these are included employee benefits. However, when you own your own business, you have to pay for your own coverage and this is often at a much higher rate since you are buying independently. Although owning a restaurant provides many opportunities and benefits to owners, there are many misconceptions about what really goes into starting and running a business. Not only do you need to deal with customers, employees and companies like my national grocers, but you also have to worry about finances, insurance and other major decisions. It is essential that you know the facts so that you can weigh the pros and cons of restaurant ownership before diving in!